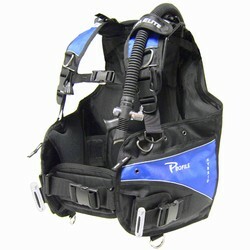 Diving buoyancy compensator being capable of regulating a buoyance of a diver and achieving rapid flotation of the diver in case of emergency. The compensator is equipped with a safety valve device adapted to be automatically opened when the compensator has been filled with an excessive quantity of air and, in the case of emergency, adapted to be opened through manual operation by the diver, to exhaust the quantity of air filling the compensator. The safety valve device includes an operating mechanism mounted in an air inlet port provided in the compensator to which an inflation hose capable of expansion and contraction is connected at one end. A pull cord connecting a portion of the operating mechanism to a portion of a power inflator carried on the other end of the hose extends through the hose so that the hose may be expanded to open the safety valve device through the pull cord.